After removal of a tree, you might want to have the stump removed. If so, give us a call. We are tree stump and root removal specialists! Stumps detract from your property’s good looks. They can also be a hazard if not properly ground down. The most effective and efficient means of doing this is with a stump grinder. 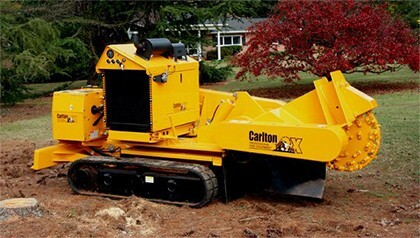 Our stump grinding equipment has the additional capabilities to grind and remove tree roots. Some root removal companies only remove roots sticking up above the ground, but we grind deep to remove the entire root structure. By totally removing the stump and roots, your yard is safer and it’s easier to grow grass or plant gardens. Walk the job site to assess the scope-of-work. Advise you of any hazards such as yellow jacket nests. Cut stumps as low as possible to the ground level. Use specialized grinding equipment to pulverize solid wood. Haul away wood mulch or leave wood mulch for your landscaping use. Other methods of stump removal include ripping out the entire stump with an excavator, or using chemicals to kill the remaining roots and accelerate decomposition.